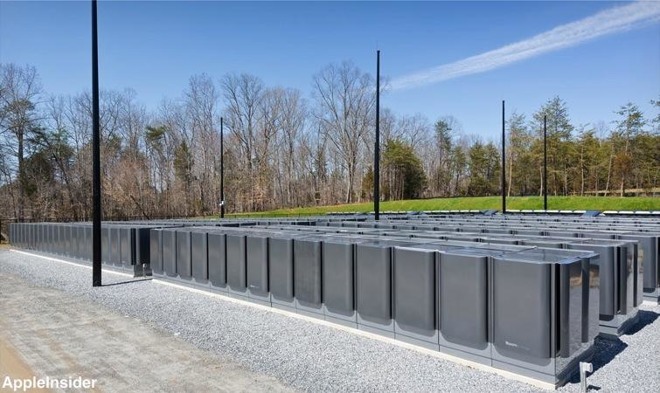 Apple last year was cited, and ultimately paid a $40,000 fine, over the handling of potentially hazardous materials at its Maiden, North Carolina, data center, according to a new report detailing the company's dealings in the state. Apple's biogas fuel system in Maiden, N.C. Citing publicly available regulatory documents, The News & Observer reports North Carolina's Department of Environmental Quality cited Apple late last year over a number of violations, including failures to conduct "proper determination" of spent fuel cell filter waste material, file a report with hazardous waste authorities, draw up a manifest for transporting hazardous waste and present said waste to EPA-identified transporters or disposal facilities. Apple also failed to pay thousands of dollars in annual fees charged to companies that produce large amounts of hazardous waste, the report said. Inspectors evaluated multiple facets of Apple's iCloud operation, including hard drive shredding and using lead acid batteries on site. The company's reliance on fuel cell technology, which creates a byproduct with a high concentration of benzene, was of particular concern. Inspectors said large quantities of hazardous waste were produced between 2014 and 2016. The fine, which Apple paid without admitting wrongdoing, is one of few blemishes on the company's reputation in the state. Other complaints range from noise issues during construction of the massive $1 billion server farm to Apple's penchant for secrecy. Helicopters are constantly flying in and out of the facility, while some contractors have carped about a distinct lack of local hires. "Something is going on over there that they don't want people knowing," said David Vosburgh, a retired construction worker whose application to work at Apple's data center was denied. "They're always building. They're very, very, very, very bad people. My opinion is they're terrible." The statement is in direct contrast with that of Catawba County manager Mick Berry, who in an interview last month lauded Apple's contributions thus far. Currently, the company employs "400 or 500 people" and generates $1.5 million in revenue for the county. County officials say Apple has invested some $5 billion in the iCloud data center, which accommodates about 400 regular employees and contractors, the report said. As noted by the publication, Apple's investment in the area has increased Catawba's tax base, allowing for the completion of public works projects like a new city hall and fire station. The county is also kicking off an initiative that seeks to train tech workers and place them in internships paid for by Apple tax proceeds. Apple also contributes to community programs like a partnership with Duke University to develop biogas solutions for the state. More recently, the company in 2016 signed a deal to convert landfill gas into energy. Other projects are kept out of the public eye, Berry said. Today's report provides perspective on Apple's impact on North Carolina as rumors of a new campus swirl. In January, the tech giant announced plans to open a new U.S. campus that will initially house AppleCare workers. Apple CEO Tim Cook later said the company would not hold a public bidding process to decide the facility's location, adding that it had made headway in narrowing down prospective sites. Reports in May suggested Apple was eyeing North Carolina's Research Triangle for the new campus, while follow-ups said the arrangement is a "done deal" so long as state legislators approve certain financial incentives to breaking ground in the area. Apple received similar favorable treatment in 2009, when lawmakers passed legislation that cut the company's tax burden by an estimated $46 million over the course of ten years. Catawba County also extended tax breaks as part of the deal, the The News & Observer reports. The original ten-year agreement has since been extended to 30 years.